When you have questions about C# 6.0 or the .NET CLR and its core Framework assemblies, this bestselling guide has the answers you need. C# has become a language of unusual flexibility and breadth since its premiere in 2000, but this continual growth means there's still much more to learn. Organized around concepts and use cases, this thoroughly updated sixth edition provides intermediate and advanced programmers with a concise map of C# and .NET knowledge. 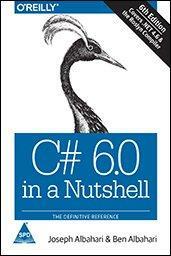 Dive in and discover why this Nutshell guide is considered the definitive reference on C#.